A book entitled “Azerbaijan and the United Kingdom 100 Years of Partnership” was presented on April 12. Speaking at the event, Azerbaijani President`s Assistant for Public and Political Affairs Ali Hasanov underlined that relations between Azerbaijan and the UK serve as an example for European countries. The presidential aide noted that the history of cooperation, which covers all areas, ranging from diplomatic relations between Azerbaijan and the United Kingdom to economic, political and trade relations, is measured in a century. “If we are talking about systemic links, then we can celebrate the 100th anniversary of these ties. However, the ties between Azerbaijan and the UK go back to ancient times, according to historical data, these links are recorded in the annals of approximately 16-17 centuries. The history testifies that the Queen of Great Britain Elizabeth Tudor sent with her envoy a letter to the Safavid Shah Tahmasib. Thus, diplomatic and economic relations were established between Britain and the Safavids,” Hasanov said. The Assistant to the President noted that during the years of the Azerbaijan Democratic Republic (ADR), the Governor-General of Great Britain often came from Tbilisi to Baku, regulated further political and economic relations with Azerbaijan, and Britain actually recognized the ADR. “In the subsequent period, as a result of the fall of the ADR, not Azerbaijani-British relations, but relations between Great Britain and the USSR were established. The period of independence of Azerbaijan covers a wide range of relations between the two countries. The first ambassador received by national leader Heydar Aliyev, who came back at the insistence of the people to power in Azerbaijan in June 1993, was the British ambassador. At the end of July of the same year, an expanded meeting was held between the British ambassador and national leader Heydar Aliyev,” he said. Hasanov added that the United Kingdom then chaired the UN Security Council, and the adoption of the 853th Security Council resolution took place at the direct initiative of the United Kingdom during its chairmanship. “If you look at four UN Security Council resolutions to resolve the Nagorno-Karabakh conflict, you can see that the 853rd resolution, in the most precise formulations, requires the unconditional withdrawal of Armenian invading troops from the occupied Azerbaijani territories,” he said. The President’s Assistant noted that following this, in Azerbaijan, in the true sense of the word, a period of creation of a new history began. “BP is a foreign company that has invested the largest amount of investments in the energy sector of Azerbaijan. BP played an important role in raising relations between Azerbaijan and Great Britain to a strategic level. And today, the United Kingdom is the largest partner of Azerbaijan in Europe. The two countries have established strategic relations in all spheres, and today's relations in the economic, political, social and other spheres serve as an example and standard for European countries,” he stated. “We believe that the UK will continue to play the role that it has played before in the settlement of the Armenia-Azerbaijan Nagorno-Karabakh conflict, will provide its support to the recognition of the fair position of Azerbaijan in the international arena, the liberation of the occupied territories, return to their native lands more than one million refugees and internally displaced persons of Azerbaijan,” Hasanov concluded. The author of the book, SOCAR Vice President Rafiga Huseynzade, informed about the work released by the British Senate Publishing. Huseynzade noted that the book contains information on all spheres of relations between Azerbaijan and Great Britain. 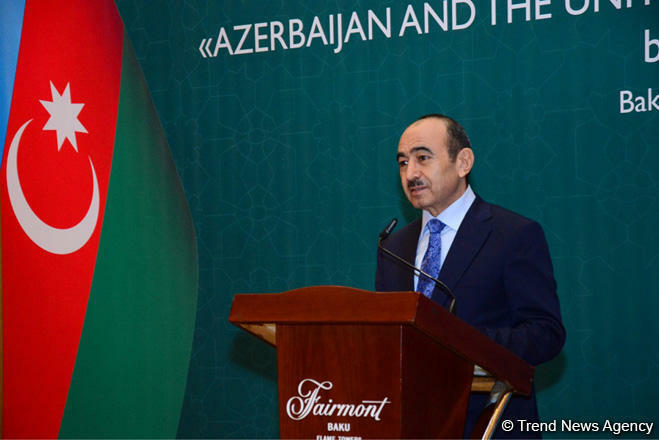 In his speech, Deputy Foreign Minister Ramiz Hasanov spoke about the history of Azerbaijani-British relations. Hasanov said that these ties are deeply rooted. “Great Britain is one of the first western countries that recognized the independence of Azerbaijan. After the visit of great leader Heydar Aliyev to the UK in 1994, relations between the two countries deepened, and this activity on the development of relations is being continued today by President Ilham Aliyev,” he said. The head of the Senate Publishing, a member of the House of Lords, David Evans, in his speech stressed that there are about 500 British companies operating in Azerbaijan. “I am confident that this relationship, based on sincere friendship, will be continued,” he said.